I believe this tag is my favorite of all the ones I did for 2011. And it is my final tag reveal for you....til next year that is. Tim Holtz came out with a Tattered Pine Cone Die and I had to rush right out and get it. Not only does it make great pine cones, but shabby vintage roses too. It's a two-fer!! And the die even has greenery on it. Great die for the money. If you are considering this die, be sure to watch the video on Tim's blog. It is really helpful when you make your very first one. 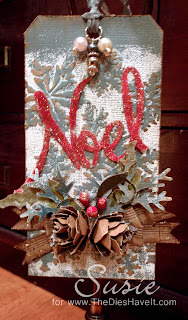 I cut the word NOEL using my Slice die cut machine. I used a mid-weight chipboard, inked it and then glittered it with Martha Stewart glitter. Tomorrow I am going to show you a little project straight from Lisa Pace's first book, Delight in the Details. Can't wait to show it to you.